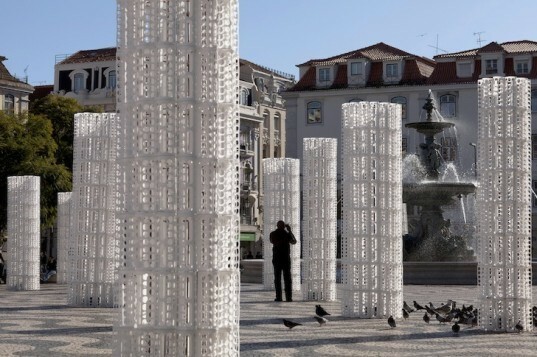 These amazing "Frozen Trees" made up of thousands of IKEA plastic bag dispensers were originally designed as a Christmas installation for the D. Pedro IV square in Lisbon, Portugal. 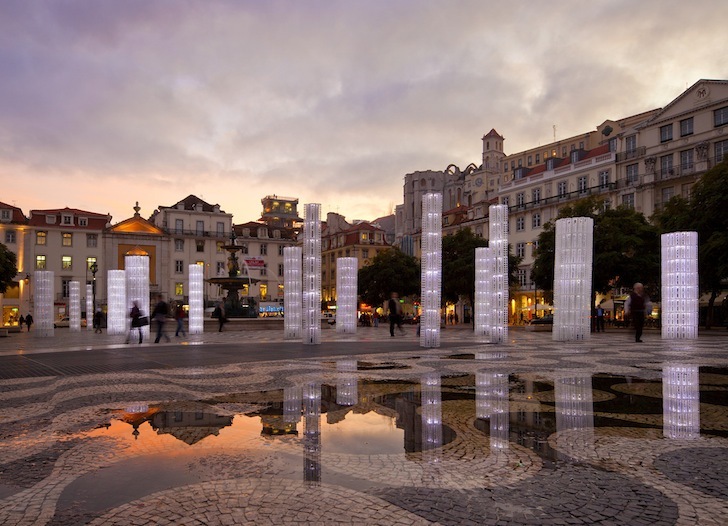 LIKE Architects turned the ordinary objects made of recyclable polypropylene plastic into 30 ethereal, LED-illuminated street lights, transforming downtown Lisbon into a veritable fantasy land in the process. 2400 of the Rationell Variera IKEA pieces were used to create the Frozen Trees installation. The plastic pieces were connected to a lightweight metal frame and white monochromatic LED lights were connected to triangular rings in order to illuminate the beautiful structures. Although each of the 30 pieces are 3.6 meters tall, they were constructed in three different diameters. Completely modular, the installation was constructed in the designer’s studio before it was transported to the square and secured to the ground for stability. They are very easy to construct and even easier to take down so that this project has virtually no environmental impact save for the plastic pieces themselves. However, these are easily re-used or recycled. LIKE Architects is currently seeking a new home for this wonderful exhibit. An ordinary object is transformed into ethereal street lights! How cool is that? Since the exhibit packs up and down in a jiffy, it has virtually no environmental impact. LIKE Architects is currently seeking a new home for this wondrous fantasyland.